The exhibition combines two separate collections in two different media, each presenting a perspective on the American West around the time of the Gilded Age. The exhibit features the reality depicted in glass-plate photographs taken by Evelyn Cameron highlighting pioneer life in the Montana Territory at the turn-of-the-20th century, juxtaposed against the historically-based, yet romantic oil paintings of 20th-century artist Alfred G. Vetromile that portray American Indian life and culture. Although the Gilded Age (approximately 1865 to 1914) was synonymous with the industrialization of America and the subsequent growth of enormous wealth for a select few, it also was the period when the dramatic story of the final settlement of the American West occurred. Vast tracks of land were settled by waves of homesteaders, ranchers and entrepreneurs pursuing their dreams. The west was made more accessible with the expansion of the railroads. J.P. Morgan, the brother of Ventfort Hall’s Sarah Morgan, assisted in the financing of the construction of the railroads that transported settlers west and freight east. Yet, with this economic development came the subjugation of the Native American peoples, by 1890 their collective population had dwindled to fewer than 250,000. The year before, British honeymooners Evelyn and Ewen Cameron arrived in the remote badlands of eastern Montana Territory. An unlikely couple in an unlikely place, Evelyn had married Ewen despite her wealthy family’s objections to this naturalist, who was 14 years her senior with few financial prospects. The harsh life of frontier Montana depicted in Evelyn’s photographs was an extreme contrast to upper class English gentility, yet both Evelyn and Ewen thrilled at the outdoors life. The first of several of Ewen’s failed financial schemes was to raise horses for European polo players. But Evelyn began a pursuit of photography. Although the age of the Kodak “snapshot” had begun,Evelyn chose the older and more exacting techniques of dry-plate glass photography. Despite the demands of her daily round of chores,in time she mastered her art, becoming one of the most sought after photographers in Montana. She continued to chronicle the lives of the people and the harsh realities of daily existence, the variety of wildlife and the dramatic landscape of her adopted homeland until her death in 1928. These nearly-forgotten photos came to light through Donna Lucey, an award-winning writer and photo editor who lectured at Ventfort Hall last summer. 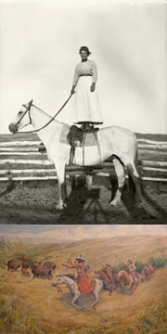 In the late 1970’s, while researching a book on women pioneers in the west, Lucey heard about a cache of glass-plate negatives belonging to Janet Williams, a 95-year-old farm woman in eastern Montana. One of the original homesteaders in the area, Williams had been Evelyn’s best friend and surrogate daughter. On Evelyn’s death, Williams stored all of her friend’s 1,800’s negatives, 2,500 prints and private papers, resisting all efforts to make them public. Consequently, Evelyn’s work and name was almost entirely unknown. After much persuasion, Williams finally allowed Lucey access to this historical prize. The result was the unveiling of the almost secret treasures in Lucey’s book, Photographing Montana 1894-1928: The Life and Work of Evelyn Cameron. This will be the topic of Lucey’s lecture when she returns to Ventfort Hall on Wednesday, September 1, at 4:00pm at the conclusion of its Summer Lecture Series. At the same time that Evelyn’s photographs portrayed the reality of the west; the grand American tradition of nostalgia for the bygone days in the west was beginning, resulting in an outpouring of art and entertainment. Frederick Remington captured cowboy life in the west in his paintings and sculptures; Buffalo Bill regaled audiences here and aboard with his popular Wild West Show; photographer Edward S. Curtis, with the financial assistance of J.P. Morgan, documented American Indian life in a twenty-volume set of books and last, but not least, decades of films and live entertainment have portrayed the Old West. Later in the 20th century, the artist Alfred G. Vetromile (1917-2006) continued to honor the rich, indigenous culture of the Native Americans through his meticulously researched yet romantic oil paintings. Twenty-eight of his works will be on view in “Dreaming of the West: Reality and Romance” – a collection of works gathered from private collectors from several states. Vetromile was born in Congers, New York and grew up in Tuckahoe, New York. Though he had a degree in aeronautical engineering from New York University, he also attended the Art Students League where his painting skill developed under the instruction of Robert Brackman and Elmore Brown, a leading illustrator at Colliers Magazine. After World War II, during which Vetromile served as a highly decorated 1st Lieutenant Navigator in the U.S. Air Force, he worked extensively in art direction for television and advertising in New York. He was the creator of the famous Lucky Strike marching cigarette commercials, now archived in NewYork’s Museum of Modern Art. Later in his career he depicted his Air Force experiences in several paintings, which hang in the Strategic Air Command headquarters of the Pentagon. Although his career included both military service and advertising, Vetromile’s passion was exploring the history of the American West through detailed research and vividly imagined painting. His sensitive depictions of American Indian culture and way of life comprise his greatest body of works. He began every painting with weeks of careful research in order to ensure historical accuracy. Vetromile did not work from photographs or with live models. Instead, he would draw a series of thumbnail sketches, followed by a small study in oil to prepare for the final piece. Spending months every year on location in Arizona, New Mexico and California, Vetromile was able to capture the color and atmosphere of the western landscape. His representational paintings each tell a story of a moment in time as he imagined it. The Preview Opening will take place from 5:00 to 7:30pm with a champagne reception. Tickets are $35. The exhibit opens officially on Sunday May 30th and will be on view through January 15, 2011. Admission is included with the price of regular tour admission to Ventfort Hall which is $16 for adults, $5 for children and free for members. For hours and other information, or to make a reservation for the Preview Opening Reception, contact Ventfort Hall Mansion and Gilded Age Museum at 413-637-3206 or visit www.GildedAge.org. Ventfort Hall is located at 104 Walker Street in Lenox. The Exhibit and Special Events committees would like to express their sincere appreciation to the following for making the exhibit possible: Birgit Vetromile, widow of Alfred; Lena: Hermine Wind; Patrick Wind; Jeremy Bean; Charles Hall; Glenn Baer; Montana Historical Society Research Center – Photograph Archives, Helena, MT; Donna M. Lucey; Studio Two and the Ventfort Hall Exhibit/Events Committees.